Challenges are abundant in this day and age and everyone faces their own set. Emily knows a challenge. She is the mother of five young children. She is a nurse. She is the wife of a policeman. Emily started with us in 2016 and is one of the most well-known members we have. She is constantly trying to better herself but her voice can most often be heard cheering others on. She is always the first to offer help; when we host charity events and when someone is new to the gym and needs someone to show them the ropes. She knows that if she takes one step back that her steps forward must follow. Emily has way more excuses than us all, but she shows up. Emily will never be average. Emily knows how to encourage the others around her because she leads by example, never taking it easy and coasting through her workout. She will also call you out when she knows you have more in the tank. 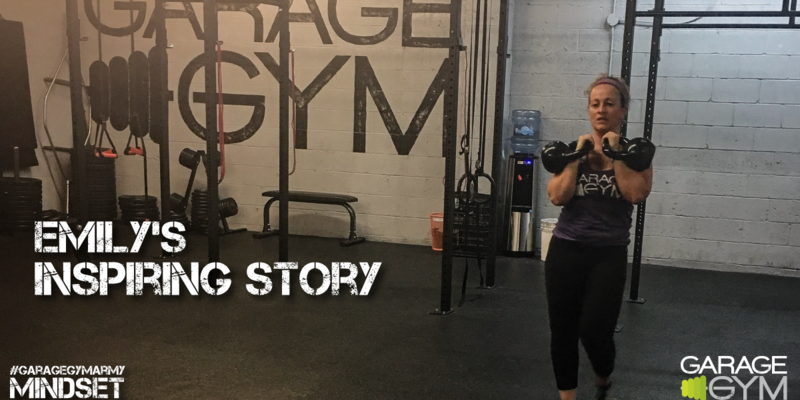 Recently, Emily participated in our 6-week transformation and not only crushed her starting body weight, body fat % and waistline; she also reset her mindset and focused on her main goal; to be her again. To be stronger. To be the best version of herself. To say that we are proud of Emily is a huge understatement. Start sculpting your beach body now! © 2018 The Garage Gym. All Rights Reserved. Made with by Web Heads.